Schnitzel is Old School but it’s a dish we come back to time and again. Although veal is the classic ingredient, we use pork for these Pork Schnitzel served with Apple Balsamic Red Cabbage. You could try making the dish with boneless chicken breast or even portobello mushroom caps, which should be delicious and vegetarian. 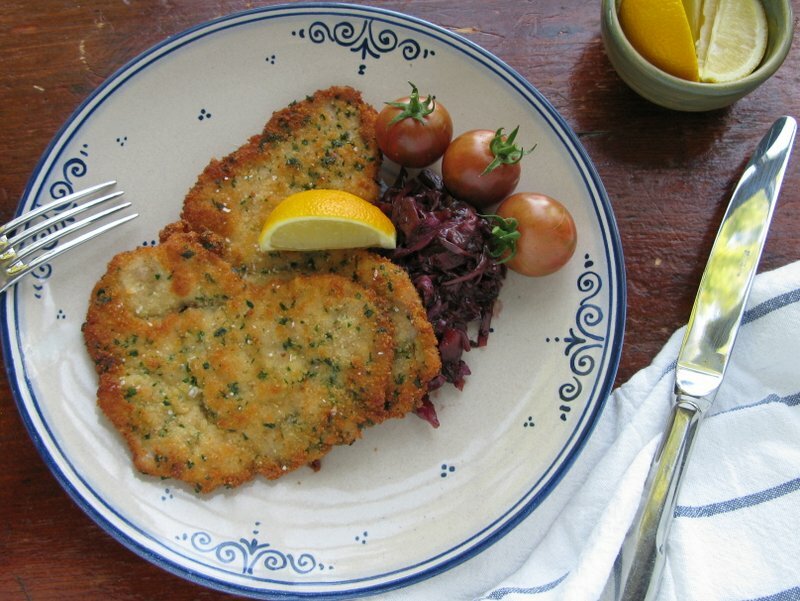 But lean pork works well because schnitzel cooks in minutes without toughening the meat. Fine bread crumbs and even heat make a thin crust that is not greasy. Each portion of meat weighs about 4 ounces, a little light for some appetites. Serve the dish with richly-flavored red cabbage and some steamed or mashed potatoes. For many, a green salad with a strong mustard vinaigrette is all that’s needed to complete the meal. To prepare the pork for frying, place a slice of pork tenderloin on a piece of waxed paper or plastic wrap. Cover it with another piece of paper or wrap. Pound the pork with a mallet or the back of a heavy frying pan or rolling pin until it is about ¼ inch thick and of a uniform thickness. Depending on how you sliced the meat, it may require very little pounding. Set aside. Combine the breadcrumbs with the salt, pepper and chopped parsley. Place the breadcrumb mixture in a shallow dinner plate. Place the flour in a second plate and the beaten egg in a third plate. To bread the pork, first dip a slice of pork into the flour. Shake off the excess. Dip it into the egg then into the bread crumbs. Set aside while you coat the remaining meat. Cover and place the breaded pork in the refrigerator to chill before frying. Prepare the Apple Balsamic Red Cabbage while the breaded pork chills. Cut the piece of cabbage in half. Remove the white core. Slice it thinly then cut into 2-inch pieces. Heat the grape seed oil in a saucepan large enough to hold the chopped cabbage. Add the onions and cook them until they are soft and translucent, for about 4 minutes. Add the apple, cabbage, vinegar, jam and water. Stir to dissolve the jam and blend the ingredients. Bring to a boil. Reduce the heat. Cover and simmer the cabbage until tender, for approximately 30 minutes. To cook the Schnitzel, heat the oil in a large shallow frying pan over medium high heat. Heat the oil to 360°F. If you do not have a thermometer, test to see that the oil is hot enough by placing a piece of bread in the oil. When the bread is at the proper temperature, the bread will immediately sizzle and it will turn a golden brown within 5 minutes. Place the breaded pork in the pan without overcrowding. Cook for 3 to 5 minutes on each side or until the crumbs are golden brown. Remove the cooked pork from the pan to a paper-towel-lined baking sheet. If necessary, keep it warm in a 200°F oven while cooking the remaining slices. 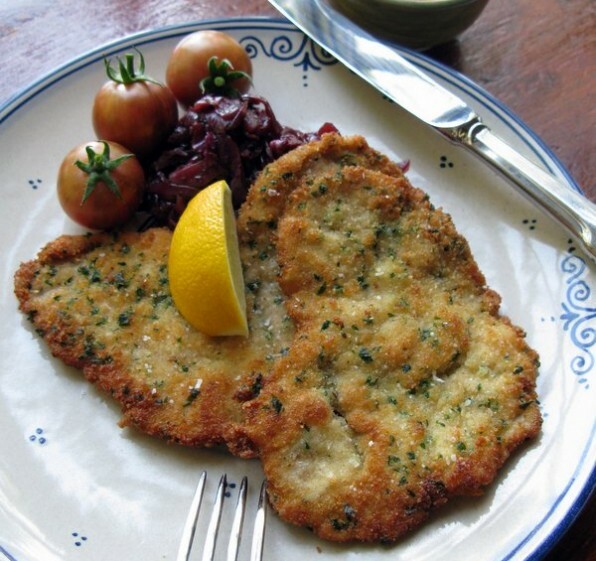 Season the schnitzel with salt then serve with lemon wedges and a scoop of Apple Balsamic Red Cabbage. Weiner Schnitzel is made with veal. That is the standard bearer for this recipe. You could use boneless chicken breast pounded out or thinly sliced turkey breast. I have never tried these options but know they would work.